We want to be a partner in your printing success. To that end, we maintain a state-of-the-art, color calibrated, digital imaging workflow and prefer a one-on-one approach when working with our clients. The first step in the printing process is meeting with you to review your images on our color-calibrated monitor. If we created your source file via a scan or direct capture, then your file should be ready for printing. If not, we may need to adjust your image to prepare it for printing – we charge a nominal fee for this service. Our goal is to get an image on the monitor that matches your vision for the print. Next, we use a raster image processor (RIP) and color management application to control color transitions based on the paper and ink combinations you chose and the lighting conditions under which the print will be viewed. Finally, the RIP interface allows us to resize your image prior to printing. Often small files can be rendered up to make big beautiful prints – something to think about now that so many of us are using our cell phones as cameras. Our printer of choice is the Epson 9900, which uses archival pigment inks and is capable of making prints up to 44 inches wide and up to 50 feet long. We stock a variety of acid-free papers from manufactures such as Epson, Hahnemuhle, Lexjet, and Innova. For those projects that require something unique, we offer a variety of specialty surfaces including: canvas, watercolor paper and waterproof vinyl. Don’t see your favorite paper listed? Let us know and we will consider stocking it. 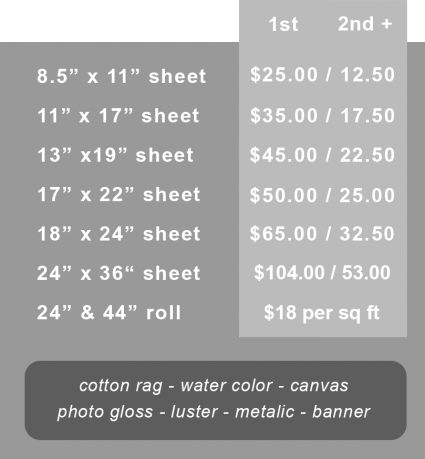 Print prices are for fine art papers. Call for pricing on specialty papers and vinyl.